Alghanim International was chosen as the main contractor for this prestigious project from Amiri Diwan for the reputation for quality and excellence in construction that Alghanim International is known for. 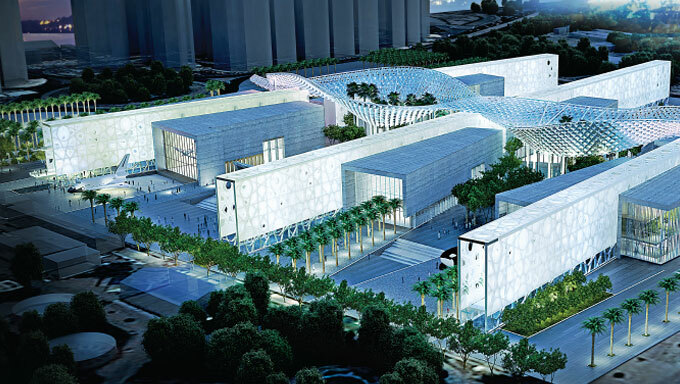 The Sheikh Abdullah Al Salem Cultural Centre is a 13 hectare site in the Al-Sha’ab area on the Western shore of Kuwait. It houses four world class Museums, a Fine Art Centre, a Theatre and an Information Centre. The cultural district is a celebration of the scientific and cultural achievements of mankind and the scale, shapes and shades of the buildings are designed to convey a sense of wonder and awe. Each building contains an array of permanent and temporary world class exhibits and artworks. Walking through the cultural district beneath the uniquely designed canopy of the street is a journey full of surprises, with stunning views deep into the heart of the museums where visitors can see framed vistas of priceless exhibits. Kuwaiti architecture is represented by the main ‘street’ which is not a straight line and echoes the traditional ‘Ferej’. This creates exciting spaces, Islamic patterns, corners and walkways, mirroring the experience of walking down a traditional, busy Kuwaiti street. Together, the museums celebrate not only Kuwaiti, Islamic and Arab culture and history, but also embrace and showcase the rich diversity of the world’s finest cultural achievements. Galleries interpreting the prehistoric era, our earth and natural phenomena, and the wildlife and biodiversity of the Kuwait region. The museum provides a stunning visitor experience in its ecosystem gallery, which takes visitors on an adventure down through a rainforest canopy to a mangrove environment, and then further down still into and under the Arabian Gulf, with a 1,000 cubic metre aquarium tank complete with acrylic walkthrough tunnel. The Islamic Museum includes exhibits on the Kuwaiti ruling family and the development of Islamic art, architecture and science. Cased artefacts, together with reconstructions, interactive and audio-visual presentations celebrate the influence of the Islamic world, and the culture and crafts of the Muslim world, past and present. The Space Museum tells the story of the earth and the universe, and also includes a 130 seat planetarium. A separate gallery focuses on space travel and exploration, and the technologies involved that affect our daily lives. A key element in this area is an immersive reconstruction of the international space station offering visitors the opportunity to learn about life in space, and the challenges involved in expanding the boundaries of scientific knowledge.